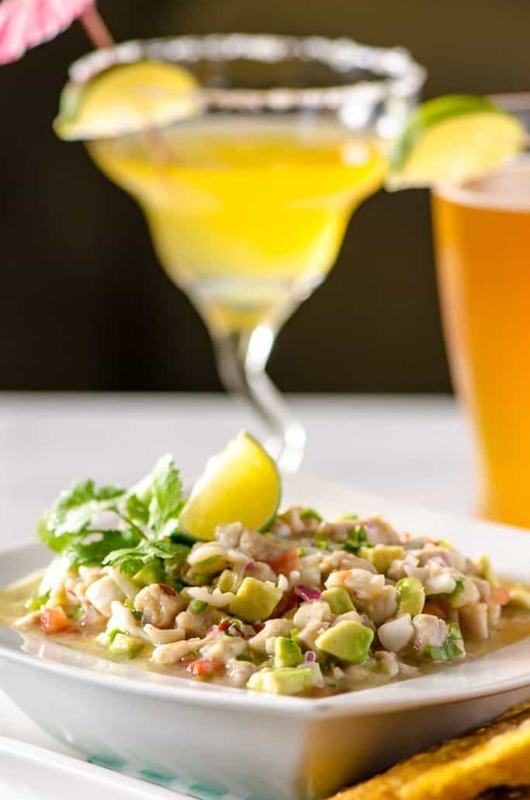 This cocktail-inspired Margarita Ceviche is a winner for any seafood lover! Fresh calamari, ahi tuna, scallops, and shrimp are “cooked” in lots of lime juice & tequila, then tossed with fresh vegetables. 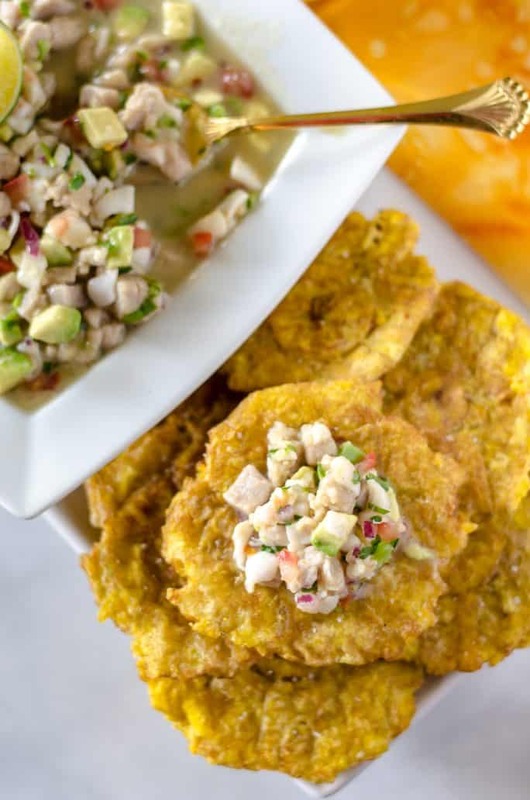 Serve it with tortilla chips or tostones – crispy fried green plantains – for a fab summer tapas dish! There is nothing like enjoying good food with good friends, am I right? Friends that love the same things you do, laugh at the same jokes, tolerate your (occasional) inappropriateness with a smile. Those same friends that will share a room with you on vacation, don’t cringe when you double-dip in the salsa, and get just as excited about the latest episode of Game of Thrones as you. Not everyone is on board with seafood, much less seafood cooked only with citrus. But a good friend would try to at least get you to try it – so here I am. JUST TAKE ME TO THE MARGARITA CEVICHE ALREADY! If you’d rather skip my (pretty darn helpful) tips and tricks, essential cooking info, and similar recipe ideas – and get straight to this deliciously easy seafood ceviche recipe, just scroll right on down to the bottom of the page where you can find the printable recipe card! Believe it or not, ceviche is the food that got me into raw sushi. Back in my college days, I used to meet up with a group of friends/coworkers at this fun little sushi joint in Daytona about once a month. The tables were situated around a sushi bar that had a “river” of floating sushi boats. The price was indicated by the color of the plate, and you could pick up whichever type you wanted as it sailed by. The folks at my table usually stuck with California rolls, Alaskan rolls (cooked salmon & cream cheese), and KFC rolls (yeah, chicken). We all had similar tastes. Then I met Abe and my whole culinary world was turned upside down. He introduced me to his Margarita Ceviche and I suddenly couldn’t get enough raw fish. Hang with me, here. This stuff is legit. 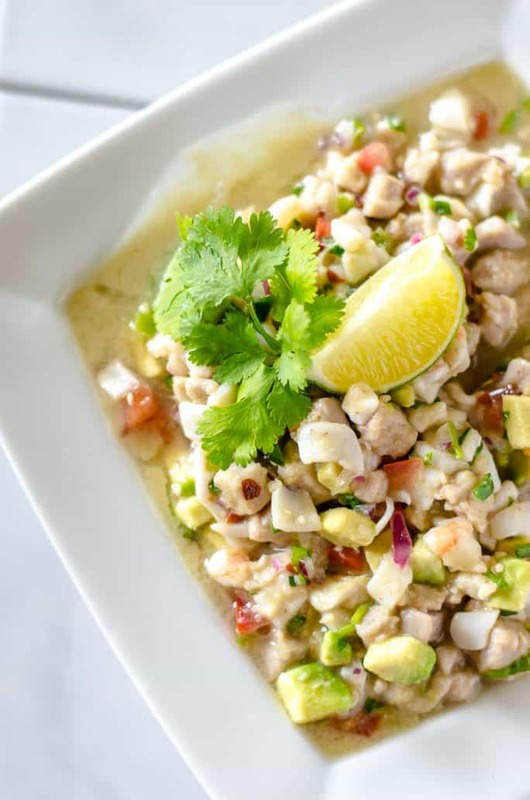 Also known as cebiche, seviche, or sebich around the world, it is considered a national dish in Peru, and only reached the United States in the 1980s. Is Ceviche Safe To Eat? 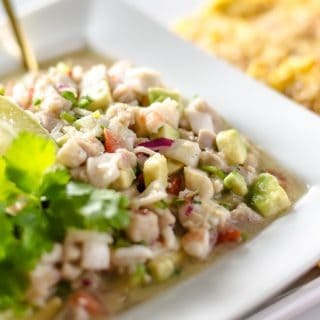 Ceviche is perfectly safe to eat, as long as super fresh seafood is used, and it is prepared in a sanitary environment. 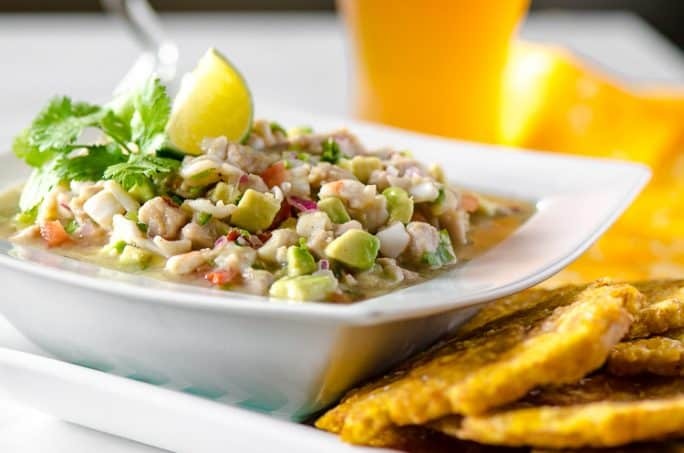 The seafood in ceviche is cooked by the acid in the citrus juices, rearranging proteins and making it safe to eat through a process called denaturation. Just like by the heat of an oven, stovetop, or grill, the food is cooked by the citrus (and tequila, in this case), but it’s not killing off any potential bacteria in the seafood like heat does. When you plan to make ceviche, purchase your super-fresh seafood the day of and pop it in the freezer for a bit prior to preparing it. You can also purchase frozen fish and thaw it to use. If you’re still worried about possible bacteria in your seafood, blanch it in boiling water for one or two minutes before marinating it. It won’t be traditionally prepared, but will still be tasty! As with any raw seafood, pregnant women and people with compromised immune systems should avoid ceviche. 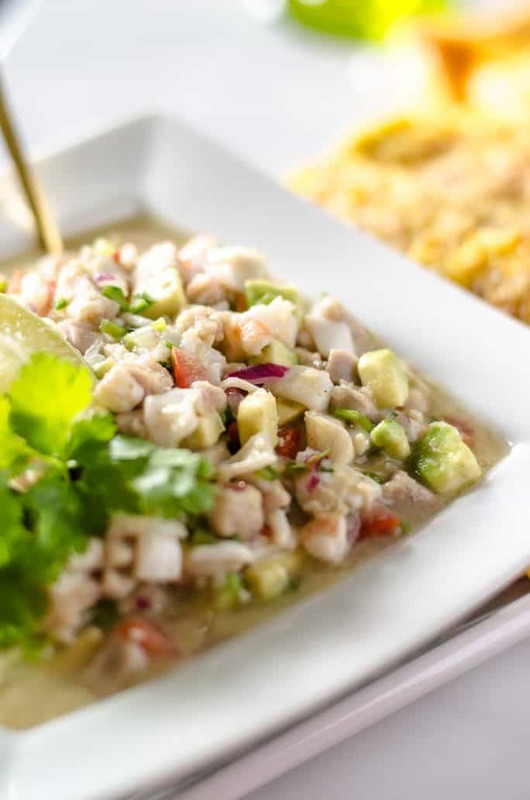 What Kind Of Fish Is Best For Ceviche? The freshest fish, truly the best for ceviche, is sushi-grade, which can be found at any fish market. If you plan to use fish from your supermarket, frozen is an equally good and safe option. 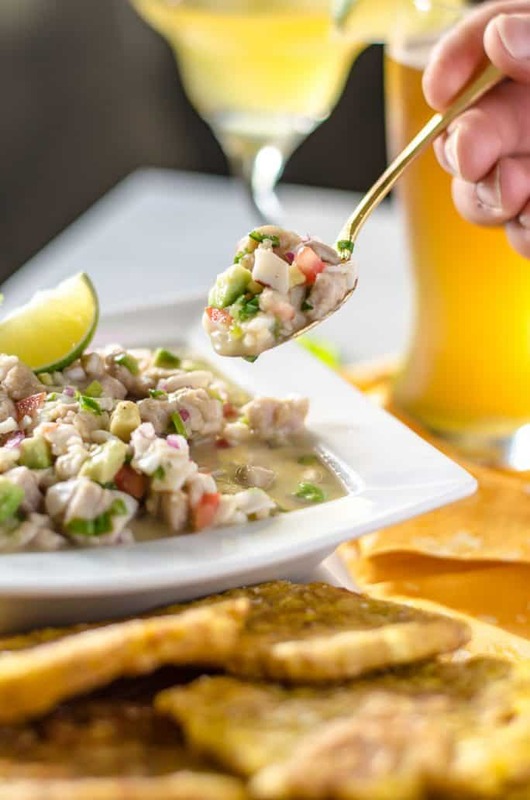 Firm and semi-firm white fish like bass, grouper, or flounder are usually recommended for ceviche. I have found that tuna works very well and adds an umami flavor that white fish lacks. Feel free to experiment with your favorite fish, or try a combo. How Long Does Ceviche Last? 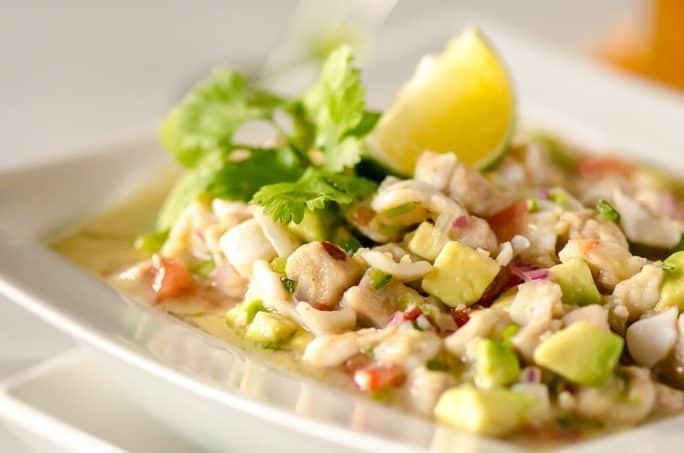 Fresh ceviche should be eaten immediately after cooking & mixing for the best flavor and texture. It can be stored up to 48 hours, but the quality of the dish will degrade over time, as the citrus continues to cook the ingredients inside. First, chop up all your fresh (or previously frozen) seafood – calamari, shrimp, scallops, and tuna. Smaller pieces mean faster cooking time! Place the chopped seafood in a metal or steel (non-reactive) bowl. Then, add the lime juice, tequila, and salt and stir well. Cover the bowl with plastic wrap and chill it for at least 30 minutes, until the seafood is opaque (white). You can refrigerate the seafood overnight, but it may be overcooked for your tastes. Finally, transfer the ceviche to a serving bowl. Serve it with tortilla chips or tostones (friend green plantains), garnished with additional lime wedges and cilantro. This cocktail-inspired Margarita Ceviche is a winner for any seafood lover! Fresh calamari, ahi tuna, scallops, and shrimp are "cooked" in lots of lime juice & tequila, then tossed with fresh vegetables. Serve it with tortilla chips or tostones - crispy fried green plantains - for a fab summer tapas dish! Combine calamari, tuna, shrimp, scallops, lime juice, tequila, and salt in a stainless steel or glass bowl. Stir to combine. Cover with plastic wrap and refrigerate 30 minutes to 3 hours, or until the seafood has turned opaque. Combine diced peppers, tomato, onion, and garlic in a separate bowl. Cover with plastic wrap and refrigerate until seafood is thoroughly cooked. When seafood has cooked, stir in diced vegetables, avocado, and cilantro. Refrigerate, covered, until ready to serve, allowing the ceviche flavors to mix. Transfer to serving bowl, garnish with additional lime wedges and cilantro. 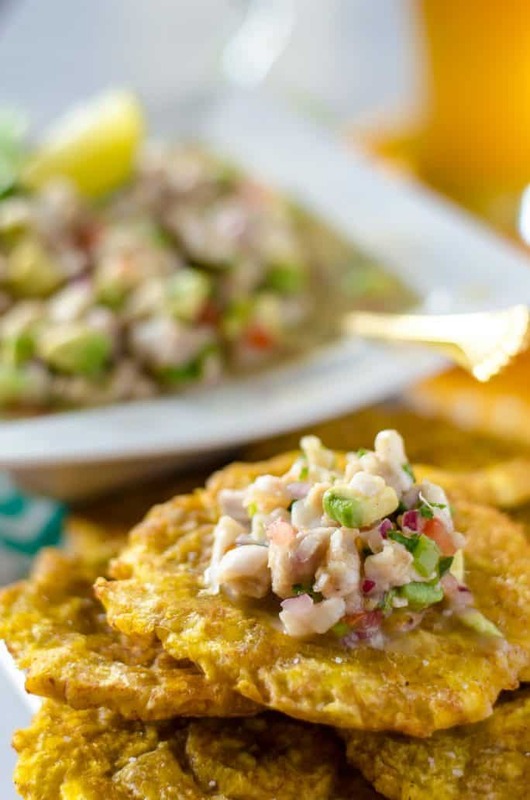 Serve with tostones (fried green plantains) or tortilla chips. Store leftovers covered in the fridge for no more than 48 hours. Nutrition facts do not include tortilla chips or tostones information. PIN THIS MARGARITA CEVICHE RECIPE FOR LATER! Find even more delish tapas dishes below! This recipe was originally published on May 15, 2016. It was updated with a revised recipe and additional content on April 8, 2019. I WISH we had something like this at dinner… Then again, I’d rather just try yours! Yum! Sounds so refreshing and perfect for summer. Hopefully I can join you guys next year! 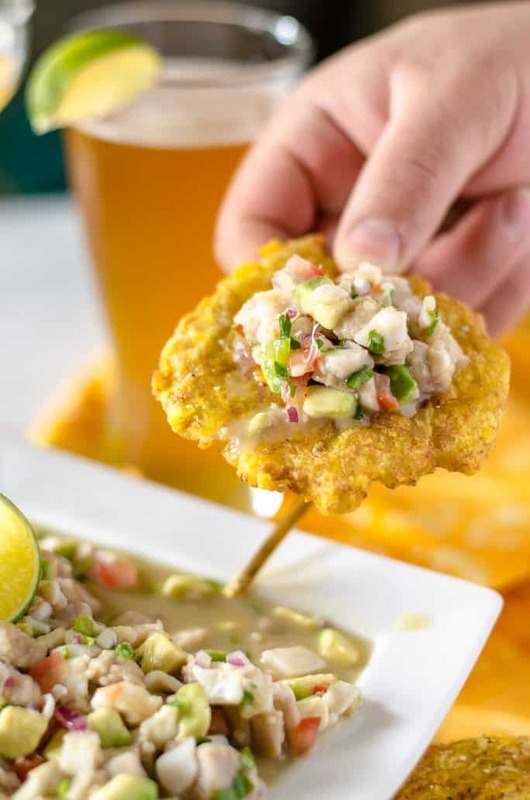 This looks so good, I love ceviche and this sounds a tasty version of it. Love hearing about food with the inlays too! My husband LOVED this! Thanks for the recipe! This has so much more flavor than restaurant ceviche! I couldn’t believe it.